Vigilantism resulted in another necklacing in Khayelitsha this weekend. Following a spate of robberies in Khayelitsha B Section, a mob of residents stoned and necklaced suspect Andile Mtsholo, 32, during the early hours of Saturday morning after he was accused of stealing cell phones. A bag full of cell phones was found next to his body. This brings to five the number of people killed by necklacing in Khayelitsha over the past few months. 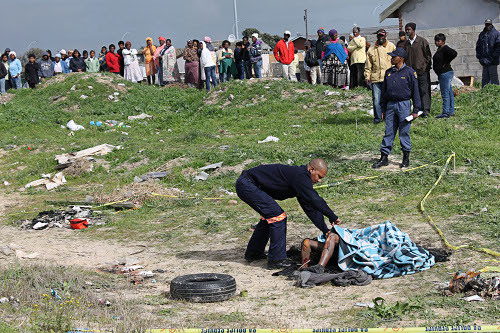 Three men were necklaced by a vigilante mob in Enkanini informal settlement in Khayelitsha on March 19. Only one of them, Ncedile Gigi, has so far been identified. Two weeks later another necklacing occurred in Khayelitsha Endlovini informal settlement. All were as a result of vigilantism after people were accused of house break-ins and theft, with community members saying the killings were a result of police not responding to calls alerting them to crime or investigating tip-offs. Residents who lived next to the field where Mtsholo was killed said they heard a noise at about 4am. When they went outside to look they found Mtsholo’s body burning but the mob had already left. Khayelitsha B Section residents said Mtsholo stole a cell phone from a young man in the area. The boys alerted residents who cornered Mtsholo and took him to the open field before putting a tyre around his neck and setting it alight. Residents in the area did not want to be identified but said they were glad Mtsholo had been killed. “The dog is dead, we will walk freely with our cell phones now,” said one. Residents said this is a first step in combatting robbery in the community. Mtsholo’s uncle, Mbulelo Mteza, said he received a call from Mtsholo’s sister informing him his nephew had been burned to death. A further two people were found dead in TR Section, Khayelitsha this weekend. Residents said one man was stoned to death and a bag of stolen cell phones were found next to his body, while the other unidentified man who was found in the wetland next to TR Section may have been the victim of a robbery. What the hell is wrong with these people, setting fire to tyres around peoples necks. And isn’t it strange that everytime they murder someone, a bag of mobile phones miraculously appear next to the body. Seems to me that these unfortunate souls are being tried by judge jury and executioner, all at the same time. The police need to pull their heads out of their arse’s and do their jobs properly.